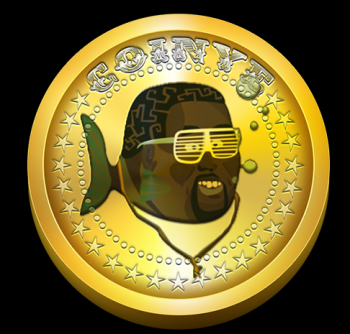 There have been some changes in Coinye's image. So what's in a name, asks the creators of cryptocurrency Coinye West; that which we call a Bitcoin by any other name would trade as sweet. Um, no, reply rapper Kanye West's lawyers, as they file a cease-and-desist. "We are in the process of preserving and protecting Mr. West's valuable publicity and trademark rights from willful and brazen infringements," say the lawyers, and so there have been some changes over at Coinye West. For starters, it's not Coinye West any more, just Coinye. The coin's image has also been changed, though the reference is still clear. But one thing the coin's creators haven't done is give in to the lawyers' demand that the domain coinyewest.com be given to Kanye, though they have changed the domain to coinyeco. "Now [West] wants to crush us and/or take our idea," say Coinye's creators, "and we've decided to stand up to the system and fight for the people." Presumably that should be read as 'fight for the people's right to mine a currency of dubious worth,' since the Coinye has no real value, and perhaps never will. Especially if West pursues legal action against anyone who ever uses it, as his lawyers warn he intends to do. Not that this is likely to stop some from jumping on the Coinye bandwagon, which will open for business today at 7 PST.